An individual or company selling or buying a business or enterprise of any type. 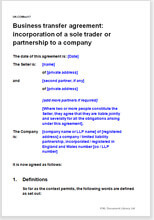 It is most common for the Buyer to provide the legal agreement. However, Sellers gain an advantage by obtaining the agreement first and making the first negotiation steps in their favour.